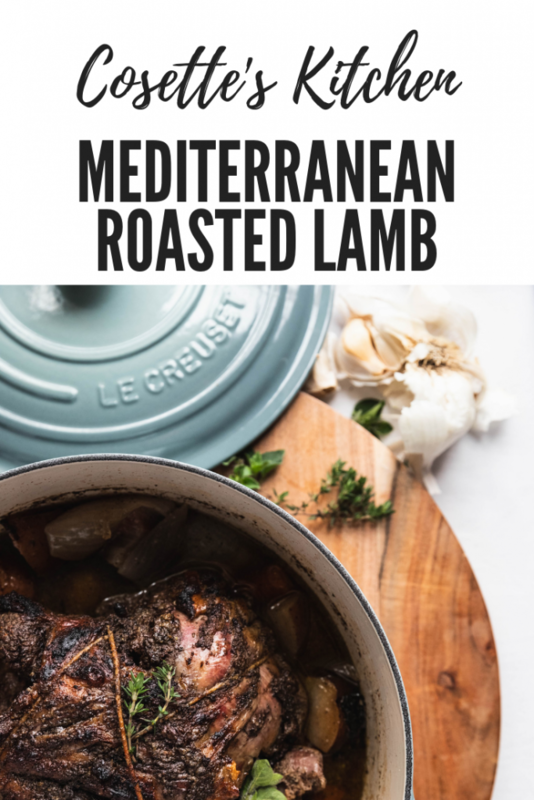 Delicious roast lamb with Mediterranean flavors roasted in a Le Creuset Dutch Oven. I’m not sure I can think of lamb and Easter without being reminded of one of the funniest movies of all time, My Big Fat Greek Wedding. They go hand in hand! Am I right? Lamb is such a common dish in Middle Eastern countries, like Greece and Lebanon. My family prepared lamb quite often growing up, especially over holidays. 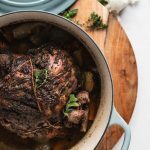 I wanted to take flavors of my childhood and create a simple lamb recipe that brings a taste of the Mediterranean and would be perfect for your holiday table. 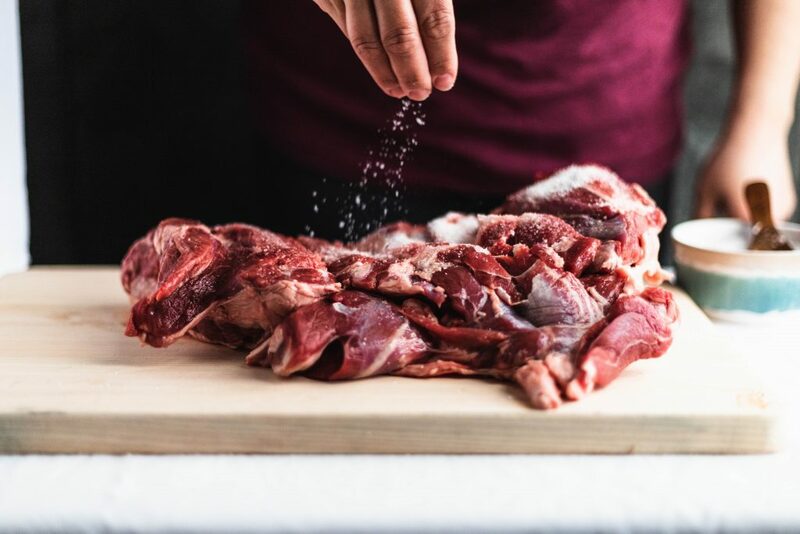 Taking time to properly salt your lamb before cooking is imperative to creating a flavorful dish. Combining simple spices and herbs, both fresh and dried gives this dish a punch of flavor. I especially love roasting meats, like lamb in a dutch oven. My Le Creuset Dutch Oven builds such flavor while roasting, keeping the meat tender and juicy. 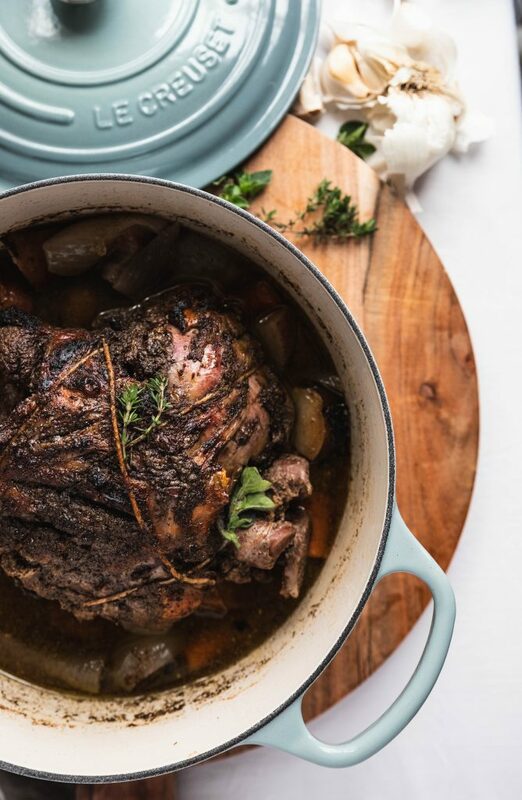 Boneless cuts of lamb cook much faster and if braising and sealing in the flavor with a dutch oven, your results will be tender and succulent. Boneless legs of lamb are butterflied making them the perfect avenue to fill with a delicious blend of herbs and spices and wrap back up. Garlic, fresh oregano, fresh thyme, rosemary, sumac and mint create a delicate but strong flavor to stand up to lamb. Lamb is prepared and nestled into the Dutch Oven. 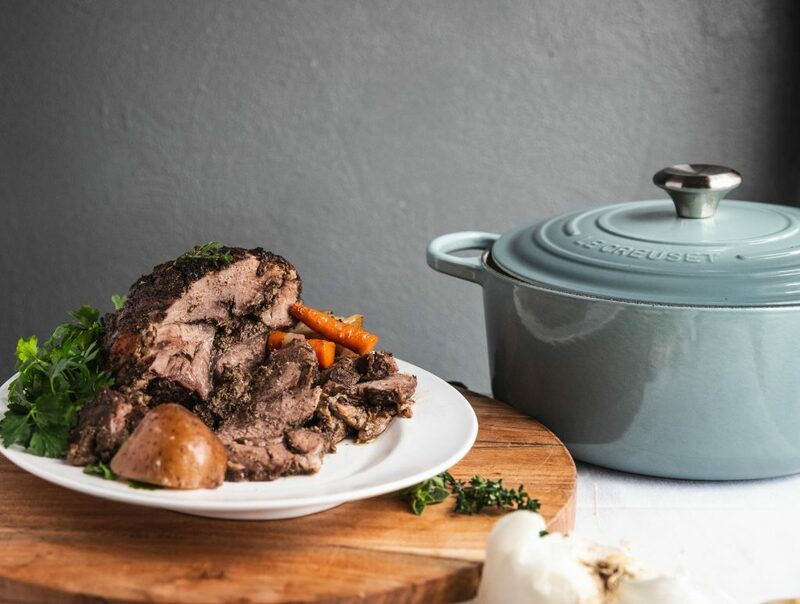 Using a Le Creuset Dutch Oven gives you the flexibility to broil, sear and roast all in one pot. I like to broil the top of of the lamb before roasting to give the exterior a nice crispy texture and build flavor while rendering the layer of fat. Garlic, olive and herbs are prepared to create a flavorful herb. 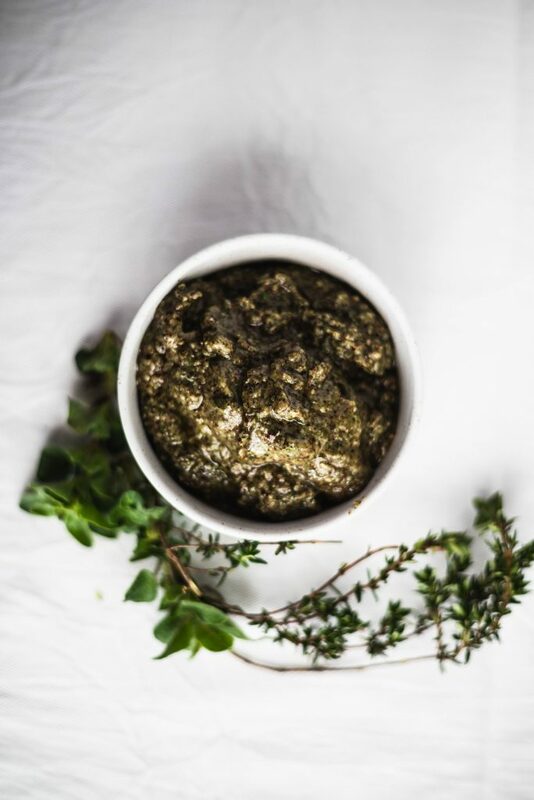 A blend of fresh and dried herbs create the perfect rub. After a few hours of roasting, you’ll be enjoying one of the most delicious lamb dishes you’ve ever had. I especially love the flavor of mint and sumac that brighten up the dish. Serve with a side of twisted mashed potatoes, fattoush and fasolia bi zeit and you’ll have the perfect meal. Finished lamb with herb rub is flavorful and perfect to serve for a family meal. As always, I love seeing your creations, tag me on Instagram or Facebook!! Don’t forget to Pin the recipe and check out Le Creuset for their new Sea Salt collection of gorgeous cook and bakeware! A beautiful roast lamb for any holiday table. Begin by carefully scoring the top of the lamb skin to create slits that are deep enough to cut through the skin but not the lamb itself. Make a crisscross pattern. 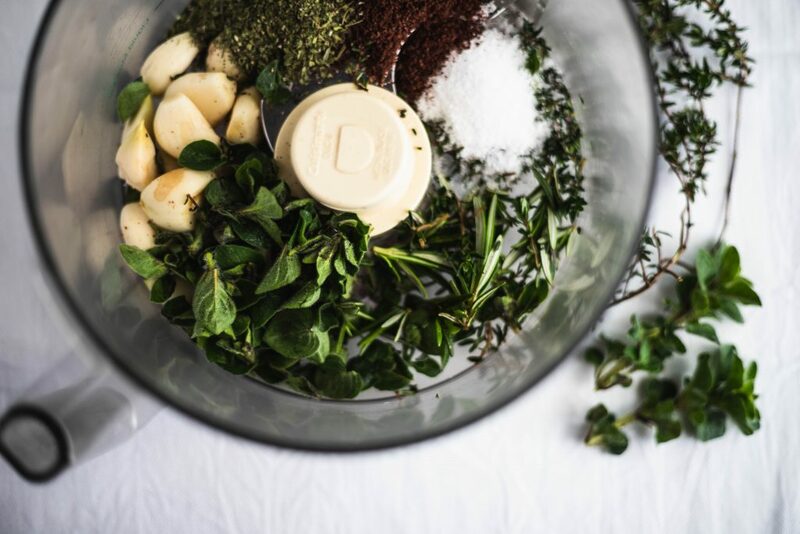 In the bowl of a food processor, add your garlic, fresh and dried herbs, olive oil and lemon juice. Pulse to create a paste. Liberally rub the paste all over the lamb, especially on the inside of the lamb. Roll the lamb and secure using cooking twine in the middle and both ends. 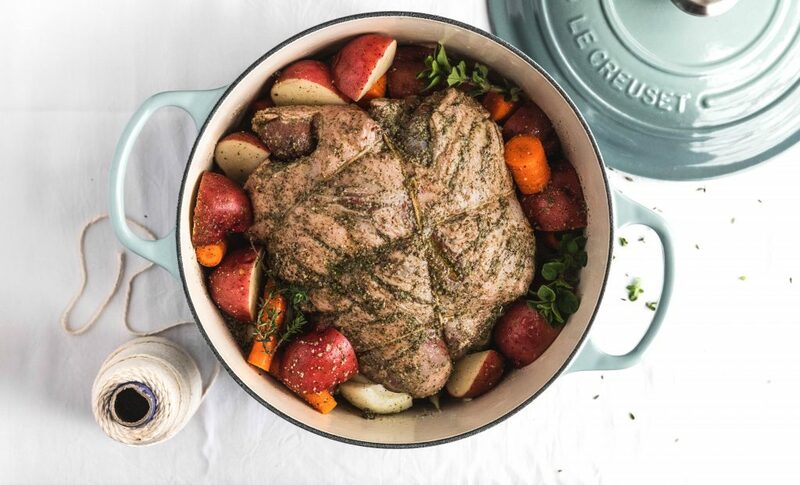 In your large Le Creuset Dutch Oven, place your lamb roast skin side up. Add your potatoes, onions and carrots around the lamb. With any remaining paste, add in 1/4 cup of water to create a slurry and add to the dutch oven. Place in oven on broil, broil for 5-6 minutes, checking regularly. Looking for the top to sear and brown. After broiling, lower oven temperature to 375 degrees and cover lamb, roast for 2 hours until temperature reaches 150 with a meat thermometer. Remove lid and broil for another few minutes before removing completely. Allow lamb to rest for 20 minutes before removing and slicing. Enjoy!